Anybody wanting to add slabs of muscle to their lower and upper body, to create a stronger and more impressionable physique, can't go past the deadlift. Indeed, in my experience as an athlete, and based on the results witnessed by many of my personal training clients, the deadlift, if performed correctly, will build unparalleled mass while strengthening all the major muscles groups. Yes, many will argue that the squat is the King of Exercises, and will contribute to more strength and size gains than any other exercise. While it is true that the squat does rank as one of the best size builders (and on this basis alone should be included in everyone's program), the deadlift, in my opinion, builds the upper and lower body like no other movement. Furthermore, deadlifting will strengthen the entire back and its surrounding muscles, making this lift great for rehabilitative, and preventative, purposes. In fact, the deadlift is the most effective exercise for building the core strength that supports all other major muscle groups. Core strength (core pertaining to the central muscles of the body; lower back, glutes and the abdominal region) is a very important health component, in that it supports the body in almost every movement and position, and the deadlift is the key core strength building movement. While there are many great compound exercises (the squat and bench press for example), the deadlift for a variety of reasons is special, and an essential addition to any program. Still not convinced? This article will explain why the deadlift is the true King of Exercises. It requires little in the way of equipment and preparation. A bar and the willingness to lift it are the only real requirements for a successful deadlift. Wraps are optional, and in many cases, not required. It builds core stability. The deadlift directly targets all of the major muscle groups responsible for correct posture and core strength. Correct deadlifting technique enables one to hold their back straight when engaging in daily activities, due to its emphasis on maintaining a straight back throughout its movement. The deadlift will also strengthen all the surrounding supporting muscles of the waist, backside, hips and, of course, lower back. Core strength is important in terms of maintaining ones balance, and weight transference (whether in sport or daily life). As mentioned, it works more muscles simultaneously than any other movement (yes, including even the beloved squat). The many muscles the deadlift targets will be discussed in the next section. The deadlift truly forces the whole body to grow. It is relatively risk free and safe to perform. With the deadlift, there is no risk of getting pinned under a maximum lift (as with the squat and bench press), and provided form is correct, will not unduly stress any of the major joints. It has a real life application. Lifting objects from the ground, from a variety of angles, is enhanced through regular deadlifting. The real life functionality of the deadlift comes into play when one becomes strong enough to lift a heavy object (furniture for example), while decreasing the likelihood of injuring themselves. It develops gripping strength. If done without wraps, the deadlift will strengthen the grip like no other movement due to the sheer weight involved (it is not uncommon for one to work up to 300+ pounds for repetitions). It could be argued that, in a powerlifting context, the deadlift is a true measure of strength due to its lack of emphasis on various performance aids (suits etc). It also employs more muscle groups, and therefore could be deemed a better test of overall muscle strength. It helps to develop cardio respiratory fitness. Like the squat, deadlifts will severely tax the cardio respiratory system if done with enough intensity. This obviously has positive ramifications for cardiovascular health. In fact, high intensity deadlifts aerobically tax the body big time. Given the deadlift is a tricky exercise to master, due to the high level of balance and coordination needed, and the injury risk if incorrectly performed, requires an intricate series of steps that need to be followed. Assume a shoulder width stance, and grip the barbell so that the inner forearms touch the outside of thighs, and shins lightly touch the bar. Either an overhand or an under/overhand (one hand over, one hand under) grip can be used. The under/overhand grip is preferable in most instances. Fix spine in a neutral position (neither up nor down, but looking straight ahead), and place the hips down. Pulling in the lower abs will ensure a neutral pelvic position. Shoulders should be held back, squeezed tightly, and positioned over the bar - they should never be rounded. Chest should be forward, not down. Before lifting the weight, tighten the shoulders and squeeze the glutes together to help generate power during the initial part of the movement. Grip hold of the bar tight, and push with the feet. The legs must power the weight up. Hips and shoulders should ascend at the same time, while the hands are holding the weight in place. Toward the top of the movement, lock out by employing more upper body strength until the weight is at about the midway position of the upper thigh. During the ascent phase, there should be an initial push with the balls of the feet followed by a transference of weight to the heels, as the bar passes the knees into the lock out position. Remember to keep the bar in contact with the body throughout the movement. Reverse step four until the bar touches the floor, pause, and repeat until completion of set. Bear in mind that the weight should not forcefully hit the floor - it should be lowered in a controlled manner while tightness is maintained throughout the body. Do not rely on momentum to power the weight up on the second rep, as this will cause a jarring effect, which might contribute to spinal damage. Correct breathing is important when deadlifting as it will assist with the ascending phase of the movement, and thus the power aspect of the exercise. Before pulling the weight, take a deep breath and hold for the first quarter of ascent. Slowly begin to exhale throughout ascent, and breath out completely upon powering through the sticking point. The standard deadlift illustrated above, will work for almost anyone. There are certain circumstances, however, where a special variation on this more common technique is called for. Powerlifters and other strength athletes often find that tweaking their deadlifting range of motion (ROM) will greatly assist them in breaking though a sticking point. ROM can be increased, thus allowing for a greater stretch and a longer loading phase, by standing on a four-six inch platform. Decreasing the ROM, thus enabling a greater emphasis to be placed on the upper body aspect of the movement, can be achieved by placing the bar at an elevated level within a power rack. "The sumo deadlift variation helps to reduce the stress placed on the lower back at the starting position." This movement, although incomparable to the regular deadlift for overall size and strength, is an excellent one for hamstring development. To begin, set the bar at an elevated level (just above the knees). Using an overhand grip hold the bar at shoulder width and release bar from rack, walking back a few paces. Bend knees slightly before descending, carrying full bodyweight over the ankles while inhaling. During this phase, allow the backside to move backwards and maintain normal head and neck alignment, looking straight ahead. Upon completion of the descent phase, smoothly bring the weight back up (never explosively lift weight as would be done during a regular deadlift). 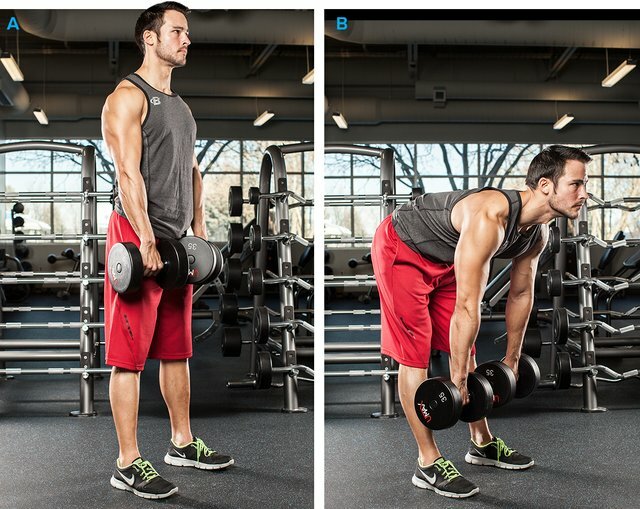 Completing a full ROM with the stiff-legged deadlift calls for excellent flexibility. Therefore it is not uncommon for a beginner to lower the bar slightly below the knees as opposed to the ankles. As flexibility improves so to will ROM. The idea behind this movement is to keep the stress on the frontal thighs throughout the descending phase, to maximize leg development. To begin, lift bar in the normal fashion as per the standard deadlift before using knee flexion as opposed to the usual hip flexion. Hip flexion should be minimized to place the greatest degree of stress on the frontal thighs. The low back, hamstrings and backside will not work as they would during a standard deadlift, thus making this movement good for the thighs but not for overall core stability. This variation helps to reduce the stress placed on the lower back at the starting position. Powerlifters often used this stance due to the tremendous weights they use. To begin, place the feet at a wider stance (about 12-inches away from the shoulders), and grip the center of the bar on the inside of the legs (as opposed to the out side on standard deadlifts). Straighten the bar and lift. With this movement, there is less potential for the back to become rounded, making it a viable option for a beginner wanting to develop a strength base, or someone recovering from a back injury, provided they have the approval of the physician. One of the main advantages of deadlifting includes overall muscle development. I feel deadlifts are superior to the squat as they feel good to perform, and provide a near total body workout. Deadlifts are viewed primarily as a back movement; as this is where the main stress is throughout the movement. Indeed, the lower back (the erectors) will become big and strong after a surprisingly short period, with the deadlift. The latissimus dorsi and associated muscles are also worked to a large degree - especially at the top of the movement. The deadlift is probably the best movement in terms of developing round, strong, glute muscles. On ascension, at the sticking point, the glutes are bought into play and can be squeezed at this point for a maximal contraction. Deadlifts also work all the surrounding hip/pelvic muscles. The deadlift works the entire leg region much the same as the squat does (except the squat is in many ways a superior leg developer). In fact most of the deadlifting movement is executed by the legs, with the back holding everything in place. All arm muscles are contracted during the ascension phase of the deadlift. The forearms, in particular, are worked tremendously. Upon completion, at the top of the movement, the shoulders are pulled back slightly which stresses them along with the trapezius. Big deadlifters are renowned by their massive shoulder and trap development. Given that heavy weights are typically used for the deadlift, and the potential for injury is great due to the complexity of the movement, it is very important to maintain correct technique at all times. The following tips will help you to get the most out of this great exercise. Keep chest forward and shoulders back, and look up. The back should never be rounded as this will make it more susceptible to injury, not to mention ruining the movement and impeding progress. At the middle of the movement, do not jerk the bar up to achieve the final concentric phase of the movement. To get past the sticking point, keep the momentum going from the bottom of the movement, in one smooth action. Keep the knees fixed throughout the movement. If the knees bend in and out, they might become injured due to the lateral movement placed on their joints. Also, do not tip forward or move feet as this puts the body off balance and may invite injury. Keep movement smooth from top to bottom. As with all exercises, a fluid motion is best to prevent a potential injury. The spine is especially susceptible to injury. Never jerk the weight. Straps for ultra-heavy weights. Although I am essentially not a fan of straps, they do have their place in some instances. To lift a maximal weight (not competition), or to break a plateau, they are useful, but should only really be used periodically or until ones grip is sufficient. With the deadlift, it is important to vary the intensity from session to session due to its taxing nature (particularly if back is trained twice a week). This is how I would structure my deadlift sessions over a six-week period. Although this is my current program, I would recommend a beginner deadlift only once a week. During the early stages it is important to set the right platform in the form of work capacity. Given the deadlift can be very difficult to perform, and because it is similar to the squat in that it works the cardiovascular system hard, one needs to develop sufficient work capacity. During this time, the heart and lungs will become adept at handling increasingly heavier workloads. Also, technique can be developed. A beginning period could last from four to six weeks, and during this period reps and sets should be kept comparatively high. At the beginning of this program, reps should be highest and they should decrease as weight increases. One day a week, preferably at the end of back training. Set One: 8-12 reps at 50-65 percent of one repetition maximum (1RM). Set Two: 8-12 reps at 50-65 percent of 1RM. Set Three: 6-10 repetitions at 65-75 percent of 1RM. Set Four: 6-10 repetitions at 65-75 percent of 1RM. Light session: focusing on speed of movement and technique. These sessions are very good for helping to maintain, or reinforce, correct technique during the heavier sessions. This session is done on its own, followed by cardio. First Set: 15-20 repetitions at 50-60 percent of 1RM. Second Set: 15-20 repetitions at 50-60 percent of 1RM. Third Set: 10-15 repetitions at 60-65 percent of 1RM. Fourth Set: 10-15 repetitions at 60-65 percent of 1RM. Heavy session: maximal weights are used in this session and it is done at the end of back training. The rational for doing deadlifts at this stage of the workout is twofold: at this time the back will be completely warm and there is usually no energy left to do anything else after deadlifts anyway. First Set: 10-15 repetitions at 55-65 percent of 1RM. Second Set: 8-10 repetitions at 65-75 percent of 1RM. Third Set: 6-8 repetitions at 75-85 percent of 1RM. Fourth Set: 6-8 repetitions at 75-85 percent of 1RM. Fifth Set: 2-4 repetitions at 80-90 percent of 1RM. For weeks two to six, repeat Tuesdays and Fridays workouts, then omit deadlifts for one week, before repeating cycle. Super Heavyweight Class: Garry Frank, USA, deadlifted 931.5 pounds in 2002. Heavyweight (242 lb. class): Ed Coan, USA, deadlifted 887.4 pounds in 1998. Heavyweight (308 lb. class): Maxim Podtynny, Russia deadlifted 909.4 pounds in 2002. Those with an existing lower back condition, or any form of heart disease, should approach the deadlift with caution (the deadlift does placed tremendous, although not damaging, pressure on the back, and does significantly raise blood pressure. Anyone experiencing any of these problems should consult their physician first. If you are not convinced already, I will repeat again: deadlifting is essential is overall muscle mass, and core strength and stability, is desired. 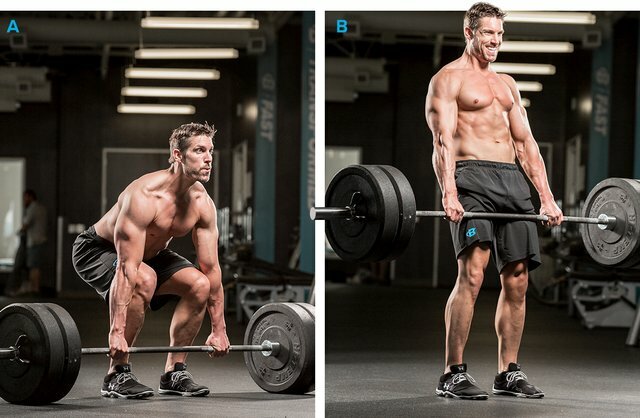 deadlifts work all the major muscle groups and provide one of the best workouts possible. Include them in your program today for fresh gains in muscle size.